Find Your Center for Passover, Here. Note: On Friday, April 19 there will be no Kabbalat Shabbat Services at the JCOH so we may all be home to celebrate the First Night Seder with our families. 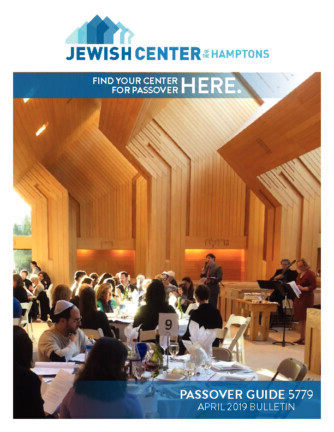 Join the Jewish Center of the Hamptons for the second night of Passover. The JCOH’s Community Seder is a multi-generational experience that elevates the traditions of Passover with music, learning, community, and great food and wine. Our Seder table will not be complete without you! To join us, please call the JCOH office at 631-324-9858. No one will be denied this experience due to finances. Speak with Rabbi Franklin or Cantor/Rabbi Stein to make special arrangements in confidence. RSVP as space is very limited. The work of the JCOH promotes the feelings of community we share as we celebrate life’s joys and sorrows, and the ongoing beauty of our Jewish traditions. With spring on the horizon, our thoughts turn to Pesach—a time to celebrate the blessing of freedom with family and friends. Are you looking to join a JCOH member to celebrate the First Night Seder? If so, please contact us and we will do our best to find a Seder for you to join. Are you hosting the First Night Seder? We ask anyone hosting a First Night Seder to put two more chairs around the table as extended family to those who have no invitation for the holiday. As we open the door for Elijah, let us open our homes and our hearts to those who would otherwise be alone. At this joyous time in our people’s history, let us create a true environment of caring.